A yummy twist on a classic cake. All the butteriness that you love about a pound cake and add pumpkin, spice and everything nice. Who else is as excited that it is October and Halloween is now only days away, 29 days when this post goes up? Like I said in previous post, I love pumpkin spice anything. I've already made Pumpkin Spice Extract, Pumpkin Spice Syrup and Slow Cooker Pumpkin Butter, which I used for this recipe (click on the name for link to the recipe). I already have so many ideas for more recipes for the next two months. For me, this might be the best cake for the season of pumpkin spice. It's light, spongy but dense. 1.) Butter and grease Angel Food/Tube Pan. Preheat oven to 300 degrees. 2.) In a large bowl, cream together butter and sugar for 5 minutes or until light and fluffy. 3.) Add pumpkin butter or puree to the butter sugar mixtures. Add vanilla extract, pumpkin spice, and sea salt. 4.) One at a time, add room temperature eggs to mixture. 5.) Slow add one cup of flour and a little milk until well mixed. Starting with flour and ending with milk. Turn hand mixer on high for 2 to 3 minutes. 6.) Add cake batter to pan and smooth out on top until even. Bake cake for 1 hour 20 to 1 hour 30 minutes or until toothpick comes out clean. Rotate the pan even so often. 7.) Remove cake from oven and place on a wired rack, let it cool in the pan for 15 minutes. Carefully remove from pan and let it cool on wired rack until completely cool. This cake sounds and looks very delicious! I just bought my first pumpkin of the year yesterday and I'm so excited to bake with it! I love the combinations of flavors! Pound cake has always been a favorite of my home. I'm on a pumpkin spice kick right now too. This cake looks delicious, although I'm trying to be healthier with my recipes this month (trying) I love this time of year - don't you? I'll definitely have to try your pumpkin butter recipe. I think that might be the best pound cake I've ever seen. The ingredients sound great and I'm going to have to try it with pumpkin butter. That cake looks perfectly cooked! So great with tea or coffee! Oooh I like pound cake and I love pumpkin. I don't have unrefined sugar and there's not time to make the pumpkin butter but I could very possibly be able to make this soon. Sounds perfect for the fall season. I will have to give this a try. Wow! This cake looks so delish! My family will surely love this. I will try this soon. Thanks! I am definitely going to try this cake. I love pumpkin spice and this cake looks delectable! Wow! This cake looks so awesome! I need it now!! This looks so good I'm definitely going to have to give this a shot before the end of October! That cake looks so yummy, would go perfect with my morning cup of tea this morning! This sounds so delicious! I've been loving pumpkin spice everything lately! Wow!1 That pumpkin cake looks so delicious and tempting. I can't wait to try this recipe. Wow!! That pumpkin cake looks so delicious and I can't wait to try this. Wow, you have been busy with pumpkin spice! This cake looks delicious. I bet it's great with a cup of coffee. I love pound cakes and this is the perfect season for pumpkin and spice. Beautiful golden brown crust! I have never jumped on the Pumpkin Spice bandwagon but for some reason this fall, I can not get enough! This looks and sounds like a perfect recipe. That sure looks delicious. Although I am not a pumpkin person. I have never had anything with pumpkin in it. This looks amazing. I love pound cake and will have to try this recipe. What an interesting twist! I still have to try pumpkin spice, I haven't seen it in this part of the world. Pound cakes are awesome with coffee in the afternoon, yum! I've been enjoying your pumpkin adventures so far, the pumpkin butter looked great but this also looks really for some cosy guilty pleasure nomming! This recipe is so mouth watering and tempting. Love the combination :) Thanks for sharing! This cake looks so good! I love pumpkin spice everything so I'm very eager to try this out! This makes me sad that I can't eat pumpkin anything! I wish I could. Heck I can't even eat eggs! This looks absolutely delicious! I love anything pumpkin spice, so it's perfect for me. And although I'm not really a baker, I think this recipe looks like one I could tackle successfully! This looks delicious. I love pound cake but it can be a little plain. This pumps it up a notch. I am loving the pumpkin recipes that are being shared by fellow bloggers! This one is especially perfect with tea! Thanks for this recipe, I would love to give it a try. I love pumpkin flavored everything. One of my many reasons of loving the fall. I will try to vegan this dish and give it a go. Great idea. This cake sounds super delicious! I need to buy a tube pan. If only I could reach into this screen and grab the entire pound cake! The pictures look amazing and I bet this cake taste so GOOD! 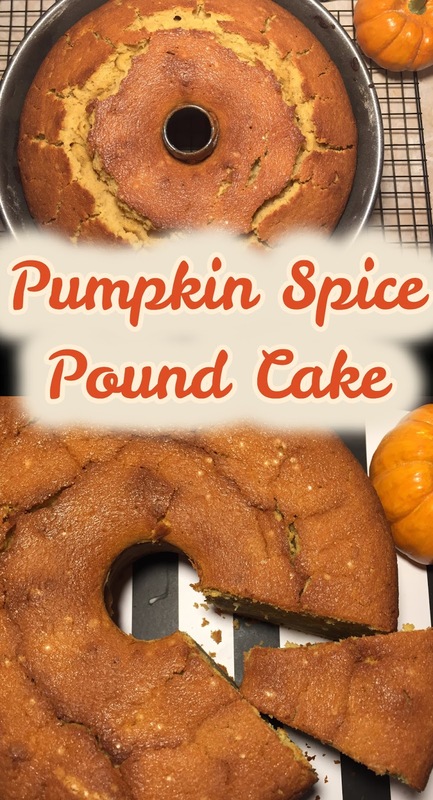 I am SO loving the idea of a pumpkin spice pound cake! I don't thing I have ever seen one, so it would be great to bring something new to work to share. I love pumpkin spice and your cake looks divine! Thanks for sharing this amazing Fall recipe! Can't wait to try this weekend! This pound cake looks so delicious. I agree to add the pumpkin, spice to make it taste even more tasty. Pumpkin Spice everything! Yum! I just bought a bundt cake pan too, I should try this out ASAP. This looks super simple and yummy! I will have to add this to my pumpkin to do list! Oh my this is amazing! I will DEFINITELY be making this for my family's Thanksgiving dinner. Thank you SOOO much for this recipe! Wow that looks amazing! This would be great to make for Thanksgiving dinner. I'm not exactly a cake person, but is pound cake the type that's dense and heavy? My bf loves chocolate pound cake, so he might like this too! My grandmother loves pumpkin spice cake. I will have to show this one to her. It sounds delish and I don't even care for pumpkin! Oh man, I love a good slice of pound cake and this one looks absolutely delicious! I've never tried a pumpkin pouncake before, that's a great twist! I am all about anything pumpkin! This sounds super tasty!! This looks so delicious! And everything about it, the ingredients, the flavour and the colour is just perfect for this month and next! It looks delicious! I'm always happy to eat anything with pumpkin spice in it as I love the flavour. I love pumpkin spice anything and everything. And I love pound cakes too. So this recipe is a winner for me.